Get people sitting in a circle. Ask them to spend a minute thinking about who they believe to be a famous inspirational leader and 1 reason why they picked them. Tell the group that some people are bound to pick the same leaders and that this does not matter, but if they could find a different reason that would be useful. Ask the group to introduce themselves (if they are meeting for the first time - skip this step if already familiar) and then name their inspirational leader with the 1 reason why they picked them. Everyone must listen without interruption. As facilitator it would be good to record names and reasons picked, so have flip chart or recording method available. As a variation on this you could ask also or instead a very powerful question - "if you were to work for "name of leader here" and you could ask them one burning question "What would it be?" Another great thing to do is prepare in advance some posters with the pictures of famous world, industrial, sporting, arts, public sector leaders etc. Pin these to the meeting room wall in various places. Ask the group to take a walk and look at the leaders and then congregate by the poster of the person they should like to work for. Once congregated, ask the group to discuss and then present back to the large group their reasons. Allow about 30 minutes for this. Reasons should be recorded on flip chart. If there are some very large groups, split them down into manageable group sizes, so you may have 3 groups discussing Nelson Mandela etc. 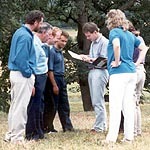 If you have only 1 or 2 people for other leaders, combine these people and present reasons for both to the large group. Also interesting to note is which leaders did not get any recruits and why this should be. After all this you should now have collected pertinent snips of information about how your group see great leaders and they will have hopefully have learnt too, what inspires other people. 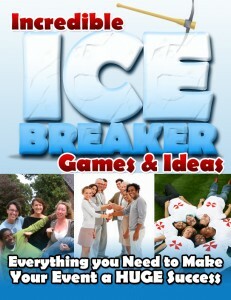 To stop endless rummaging on the web for Corporate Icebreakers including a great section on Leadership Icebreakers, instantly download our "Incredible Icebreaker Games & Ideas" - Corporate Collection. 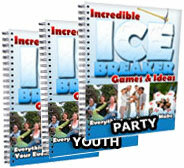 save to your laptop and you have a conveniently, accessible at all times set of icebreakers to "warm-up" your events. Gives you instant access to a shed load of great ideas to rocket-fuel your training and events.